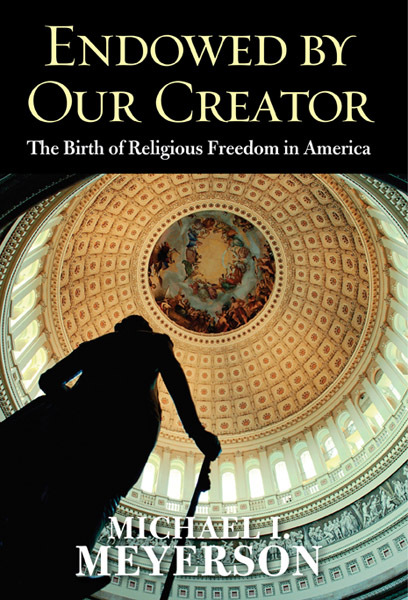 At the end of the month, Yale University Press will publish Endowed by Our Creator: The Birth of Religious Freedom in America (Yale April 2012) by Michael I. Meyerson (U. of Baltimore School of Law). The publisher’s description follows. The debate over the framers’ concept of freedom of religion has become heated and divisive. This scrupulously researched book sets aside the half-truths, omissions, and partisan arguments, and instead focuses on the actual writings and actions of Washington, Adams, Jefferson, Madison, and others. Legal scholar Michael I. Meyerson investigates how the framers of the Constitution envisioned religious freedom and how they intended it to operate in the new republic. Endowed by Our Creator shows that the framers understood that the American government should not acknowledge religion in a way that favors any particular creed or denomination. Nevertheless, the framers believed that religion could instill virtue and help to unify a diverse nation. They created a spiritual public vocabulary, one that could communicate to all—including agnostics and atheists—that they were valued members of the political community. Through their writings and their decisions, the framers affirmed that respect for religious differences is a fundamental American value. Now it is for us, Meyerson concludes, to determine whether religion will be used to alienate and divide or to inspire and unify our religiously diverse nation.